BV Sport has developed sports ankle socks that combine two criteria of efficiency: ventilation and a proper grip to the shoe, to avoid friction, provide better temperature regulation and limit excessive warming while exercising or running. 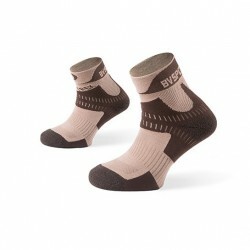 With their seamless sides, our BV Sport trek socks offer you optimum comfort. Our ankle socks aim at protecting the Achilles tendon and at supporting the ankle and foot sole. Your plantar fascia receives the right support they need. BV Sport has especially reinforced the point and the heel of those sports ankle socks to give you a friction-free experience. Inside, those socks are so comfortable that you will not want to leave them! This sock is comfortable. Its stem provided with a seamless side which is conceived from COOLMAX, providing an optimal thermic regulation.